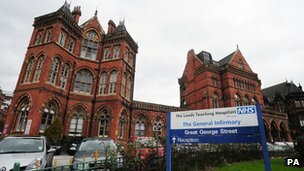 Children’s heart surgery was wrongly suspended at Leeds General Infirmary because of “incomplete” information, a senior doctor has said. The unit was shut after the NHS medical director said data showed mortality figures were higher than expected. But cardiologist Elspeth Brown said the data did not include all the operations, and that staff were confident in their clinical work. NHS managers say various factors contributed to the suspension. NHS medical director Sir Bruce Keogh said data suggested a death rate twice the national average. All cancer patients should receive a ‘recovery package’ at the end of their treatment offering ongoing support, the government has announced. Currently as many as three in four patients do not receive any information on coping with the long-term effects of their illness, figures suggest. The care plans will identify patients’ financial, mental and physical needs. Ministers called on the NHS to take “urgent action” to help cancer survivors in England. OKLAHOMA CITY (Reuters) – A Tulsa, Oklahoma, health center on Saturday began drawing blood samples from patients who may have been exposed to viruses at an oral surgery dental clinic that is under investigation. A sign bearing the logo of Teva Pharmaceutical Industries is seen in its Jerusalem oral solid dosage plant (OSD) December 21, 2011. THURSDAY, March 28 (HealthDay News) — Researchers are testing whether applying electrical stimulation directly to the brains of people with Alzheimer’s disease might improve thinking, focus and alertness. CMS is committed to working in partnership with states in administering their Medicaid and Children’s Health Insurance Programs (CHIP) and to providing flexibility in pursuit of our shared goals. WASHINGTON (Reuters) – The U.S. Food and Drug Administration said on Friday it approved Johnson & Johnson’s experimental type 2 diabetes drug Invokana to help patients control their blood sugar. NEW YORK (Reuters Health) – The number of Americans diagnosed with celiac disease continued to rise over the past decade but leveled off in 2004, according to a new study. Researchers analyzed data on a small but representative sample of people living in Olmsted County, Minnesota, and found that between the years 2000 and 2010, the number of new cases of celiac disease increased from about 11 people per 100,000 to about 17 people per 100,000.